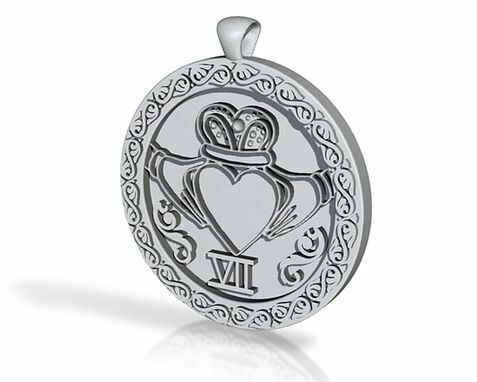 Client wanted a sterling silver pendant with Claddagh icon on front and personal text on the reverse. 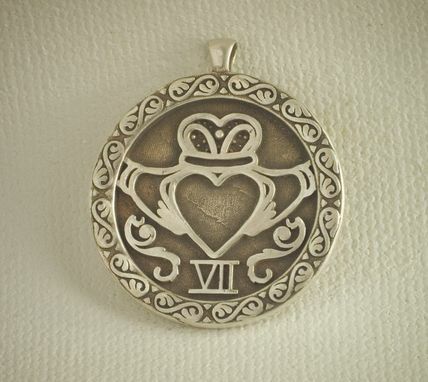 Pendant was also given an aged appearance for that "antique" look. Images show computer render proposal and finished pendant. Dimensions: 1.1 inches in width. He made it extremely easy to work with. He worked me through every aspect of the project and kept in constant communication. He provided a 3D simulation of what the final work would look like before even asking for payment. He was reliable and his craftsmanship was phenomenal. You will not be disappointed to work with this man.